That is a screen shot from a Facebook posting on July 14, 2012 where a mother describes how she took her child, infected with chickenpox (Varicella zoster), to a baseball game. And she bragged how she probably infected others (probably most were vaccinated, which indicates he level of understanding of immunizations). 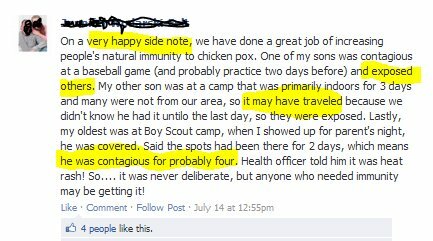 She was so proud of attempting to infect others with her son’s chickenpox that she had to tell everyone about it. The stupidity of her actions were beyond comprehension by me. Some of these complications are so serious that the patient may require hospitalization and can lead to death. So this mother thinks she can risk people’s lives because of her deliberate intent to infect others? In any other context, this would be immoral, if not illegal. Immunocompromised individuals. 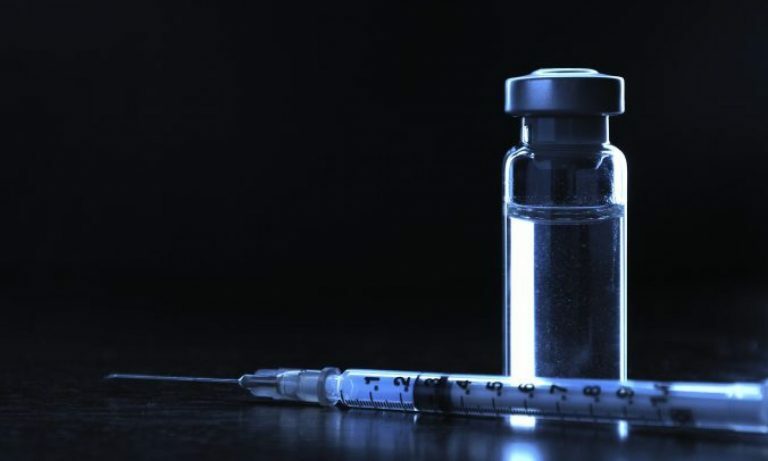 As I discussed recently, individuals who have suppressed immune systems, usually from treatments for autoimmune diseases or cancers, are incredibly susceptible to varicella (and any other communicable disease, so it didn’t just have to be chickenpox). Immunocompromised persons who get varicella are at risk of developing varicella infections of internal organs which can lead to pneumonia, hepatitis, encephalitis, and disseminated intravascular coagulation (which is the formation of small clots throughout the body). They can have an atypical varicella rash with more lesions, and they can be sick longer than immunocompetent persons who get varicella. HIV-positive or AIDS individuals. Children with HIV infection tend to have atypical rash with new crops of lesions presenting for weeks or months after the initial infection. The lesions may initially be lesions that are typically seen with chickenpox, but can later develop into non-healing ulcers. Adults with HIV are generally already immune to varicella and are usually not at risk. Pregnant women. Pregnant women who contract varicella are at high risk for serious complications, including pneumonia, and may die as a result of varicella. If a pregnant woman gets varicella in her first or early second trimester, her fetus has a small risk (0.4 – 2.0 %) of being born with congenital varicella syndrome, which may include scarring on the skin, abnormalities in limbs, brain, and eyes, and low birth weight. If a woman develops varicella rash from 5 days before to 2 days after delivery, the newborn will be at risk for neonatal varicella. In the absence of treatment, up to 30% of these newborns may develop severe neonatal varicella infection. So this mother didn’t think. She didn’t consider the awful consequences of her actions. She didn’t consider that there might be a pregnant mother in the crowd who was at risk. Or a young child who was being treated for a cancer and whose parents brought her out to watch a sibling play in a ball game. No, she didn’t think, because if she could think she would have had her child vaccinated and she wouldn’t have intentionally tried to harm her fellow humans. This woman is an awful, horrible, immoral human being.